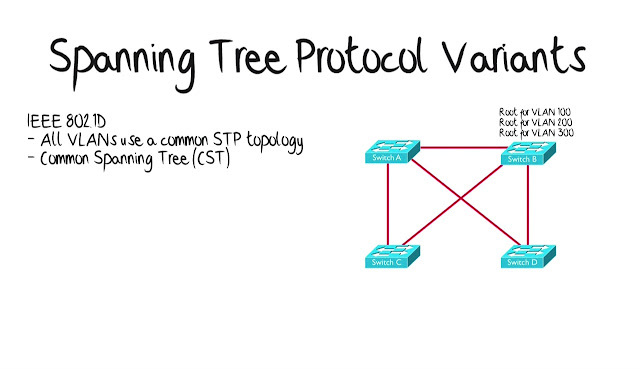 The flavor of Spanning Tree Protocol, we have been discussing, so far in this module has been The Traditional 802.1D Protocol. 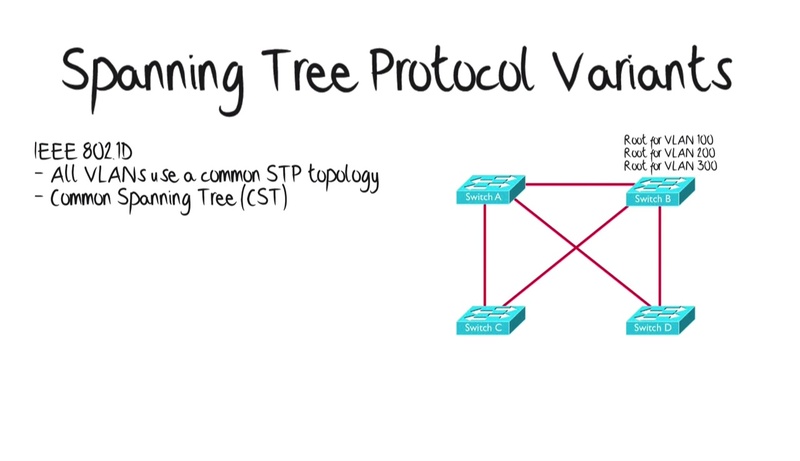 That’s where we can have a Convergence Time of 50 Seconds and that where even, if we have Multiple Vlans, all of the vlans are using the same instances of Spanning Tree Protocol, it’s called a CST or Common Spanning Tree. Are interconnected with Trunks, and we have defined 3 different Vlans 100, 200 and 300, and with a Common Spanning Tree in this case, Switch B is the Root Bridge for all of those vlans and different vlans might have different traffic patterns. It might not be optimal for Switch B to be the Root for Vlan’s 100 and 300. Well it might be optimal for Switch B to be the Root for Vlan 200 and we might have some links in this Topology that are not currently carrying Traffic, there is just sitting there, waiting for something to fail. If we were able to make different Switches Roots for different Vlan’s, not only might that give us more Optimal Pathing for different Vlan traffic patterns.it can also do some Load-Balancing for us. It could make use of some other those dormant links. Ø PVST is used of ISL Trunk. Ø PVST+ which is probably, we would see today that’s gonna be used over IEEE 802.1Q Trunks. And even though they operated bit differently that the same basic philosophy. 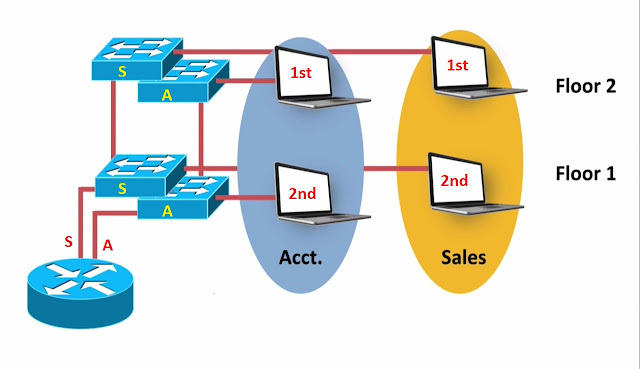 There designs to allows to give different Root Bridges, to different Vlans, for example on above picture, we got Switch A, and may be Switch A is acting as the Root for Vlan’s 100 and 300, and Switch B is acting as the Root for Vlan 200. And well this approach of doing a Per Vlan Spanning Tree, can certainly help us out with Optimal Pathing, and may be help us make use, of those dormant links. There is a bit of scalability challenge, think about it, Each Vlan is running its own instance of Spanning Tree Protocol, and if we do have lots of Vlans, odds are some of those vlans, would benefits from the same Spanning Tree Topology. They would benefit from having this same Route Bridge, just based on their similar traffic patterns. However with Per Vlan Spanning Tree, Vlans 100 and 300 in this example, their running two different instances of Spanning Tree Protocol, but we can do instead, if we do have lots of Vlan, we could define different Spanning Tree instances, we might say “Here is an instance where which Switch A is the Root, here is an instance where Switch B is the Root”, and then we could just assign Vlans to Appropriate Instances, may be One Instance of Spanning Tree is going to have Switch A is the Root, and we could assign Vlan’s 100 and 300 to that, and maybe another instances of Spanning Tree Protocol has a Switch B is the Root Bridge and we assign Vlan 200 to that Instances. 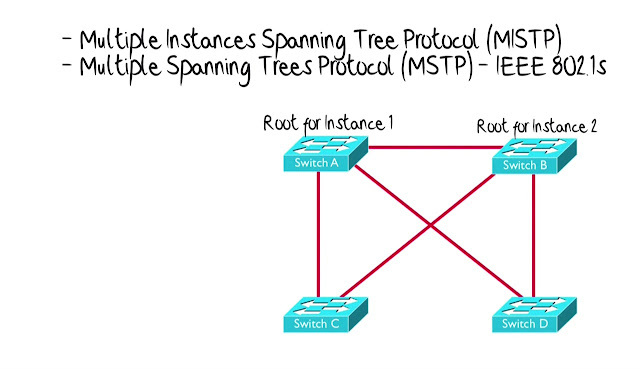 And this approach to creating a different Spanning Tree Protocol instances was originally called “MISTP”, Multiple Instances Spanning Trees Protocol. 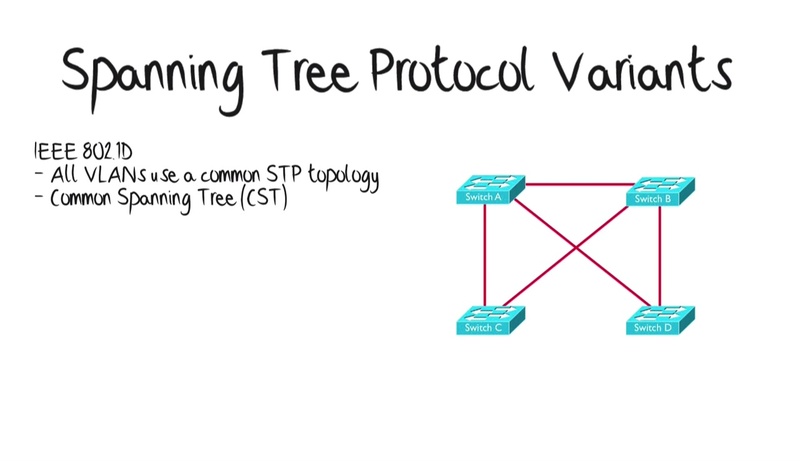 However, the term that you most likely to see in the Literature today is “MSTP”, Multiple Spanning Trees Protocol, and that actually IEEE Standard, its IEEE 802.1S, and in this module, I want to show, how to configure both PVST+ as well MSTP, but in addition to those types of Spanning Tree Protocol. 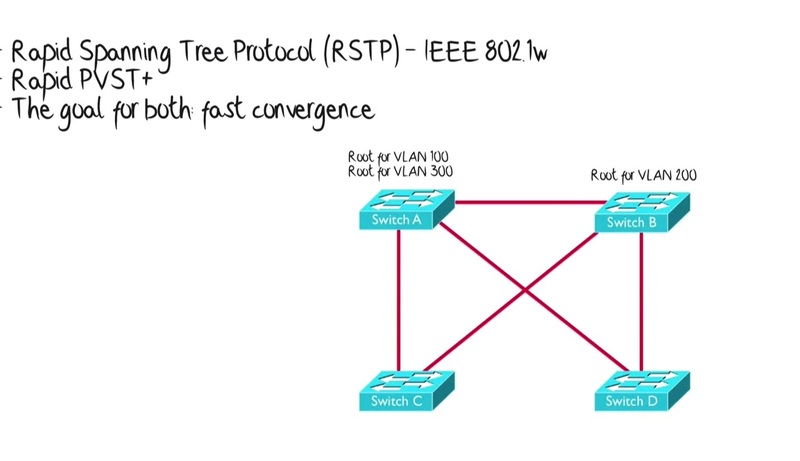 There is an another one, its Rapid Spanning Tree Protocol, RSTP and it’s a Standard as well, its IEEE 802.1W and cisco implementation its own variants of Rapid Spanning Tree Protocol, its Rapid PVST+ but the goal of RSTP or Rapid PVST+ is Fast Convergence. Remember that potentially, 50 Seconds Convergence Time that we had with Traditional STP. We want to Speed that up, and one of things you might here about Rapid STP is that, it can converge in a 2-3 Seconds. Well some time it can, but there are other instances, when it’s not gonna be quit that fast, and later in this module we were going to have a full topic that digs into. 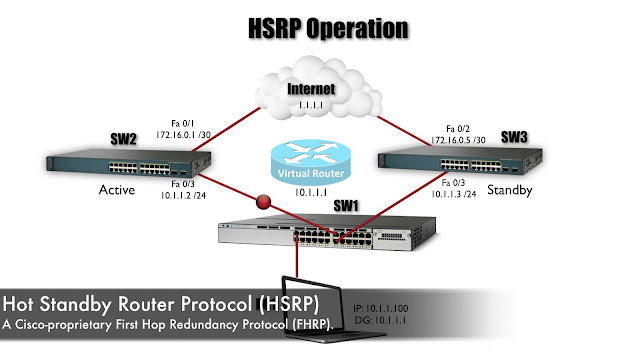 Ø How Rapid Spanning Tree Protocol or Rapid PVST+ Works? Ø But for now, just a high level here is one thing, that can help speed up the Convergence Time. When there is a Topology change on the network, and that’s defined as a Port, that’s was in Blocking State transition to a Forwarding State, when that happens. 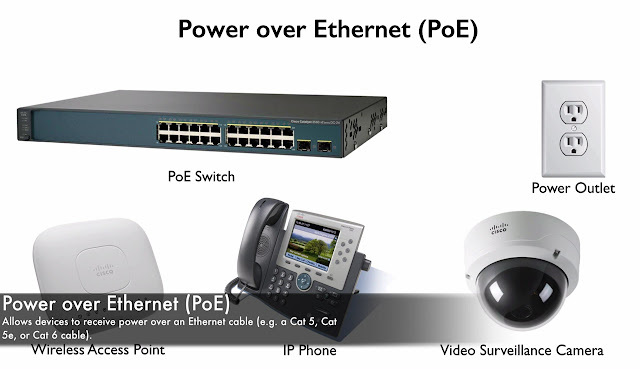 The Switch that experiencing that change, can let other Switches on Topology, know about that. 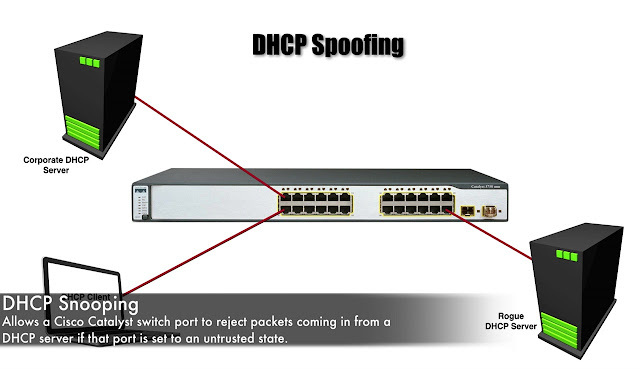 What it can do is, set the Topology Change Notification, where the TCN bit that it sends out in BPDU’s and that can cause other Switches to Flush their Mac-Address Tables, and then Relearn Mac-Addresses Table, based on this new Topology. 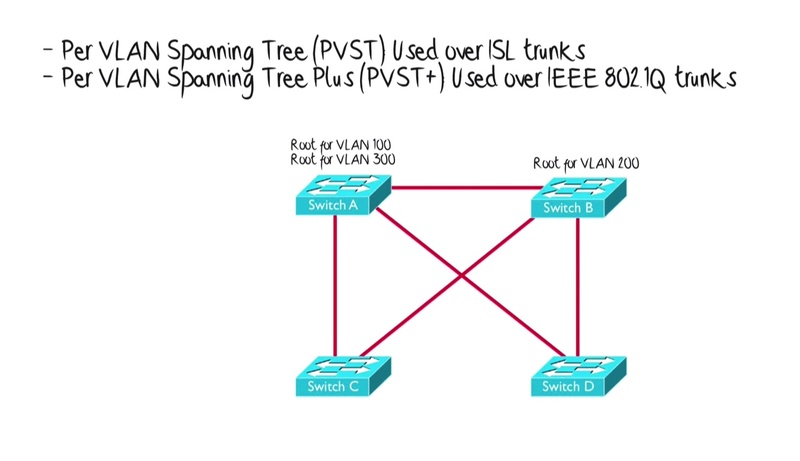 And like we said earlier with regular PVST+, we can have different Root Bridges for different Vlan’s, that way we can have more Optimally Structured Spanning Tree, and might help us send traffic over another links, that would otherwise be dormant.